As much as the music itself is decent, if you’re decidedly not Christian, like me, you have to get past some of the inherent preachiness, so approach with caution. Any way you slice it though, Christianity-based puns are great, aren’t they? Plankeye, Underoath, Overcome, Living Sacrifice, MxPx, Slick Shoes, Project 86, Relient K, Five Iron Frenzy. All of them are worth checking out, ranging from regular alternative rock, metal, punk and ska. Yes, some of them do get “preachy”, but the music is, in my opinion, excellent. I listened to a bit of Stryper, but more Whitecross. For the alternative just check out youtube for the song “Christian Side-Hug.” It’s a big pile of garbage. But the people who mock it are worth watching. Lol, this I gotta see. I’m going to have a listen. Heh, gotta love the heart chest tattoo!! Who Would Jayzuz Do? That just about killed me! Right on guys! 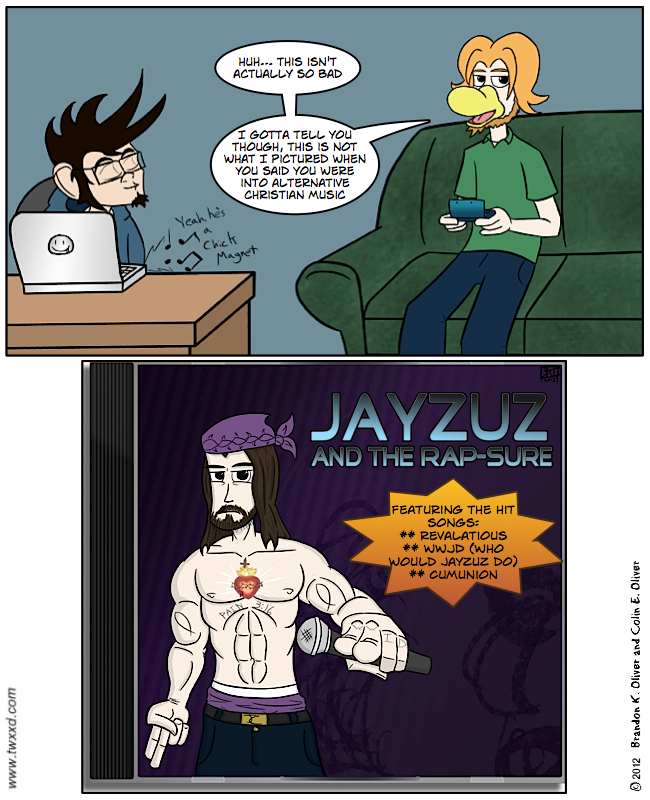 Jayzuz Chriz-ist will be pimpin’ fo You. For some reason, I suspect “Nail me baby” is another song on this cd. Oddly enough, that’s one of the few I never got into. But man, Overcome, Living Sacrifice, Blindside…all awesome.